For every story of a multi-millionaire footballer signing a lucrative contract, there is another of a player's dreams of glory ending in heartbreak. 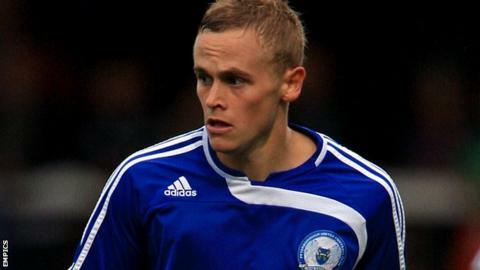 Very much in the latter category is former Peterborough United midfielder Jamie Day, who was forced to end his career at the age of only 26 because of a serious back problem. He is now facing the prospect of a fourth operation and clinging to the dream of one day returning to the club he loves as a member of the coaching staff. Day left Peterborough in 2010 and had frustrating spells with Rushden & Diamonds, Crawley and Aldershot before he had to accept the inevitable. The Cornwall-born player confirmed his retirement last month and is still coming to terms with the disappointment. "I've had low moments, put it that way. Retiring through injury is a tough thing to take, ask anyone that's done it," he told BBC Radio Cambridgeshire. However, simply coping day-to-day has to be his main focus. "The normal things you want to do in life, I can't do at the moment," the former England C international said. "The chronic nerve pain, it's a pain that unless someone had it, you can't really describe it to them. "It's been a year but it feels like 10 years and it's been tough for me and my family." Day's condition is such that his next operation will involve the insertion of a spinal chord stimulator. He added: "Thinking back 18 months to what I was doing and what I had, it's been really hard mentally. "But hopefully I can get it fitted and it can work to a point where I can go out, go to work and live my life again." If the operation is a success, Day will then look to take the first steps towards turning his coaching dream into a reality. "That's been the thing in the back of my mind that I've wanted to do. "I thought I was going be 35 when I was looking for a coaching role, not 26, but I've still got a lot of close connections with Peterborough so hopefully the door's open for something once I'm better. "I've kept in touch since I left and when they found out the news, they've all been supportive." Peterborough are currently struggling at the foot of the Championship table, having lost all seven games so far this season, but, as Day knows only too well, fortunes can soon change. "For Peterborough to be competing in that league, first and foremost, is fantastic," he added. "I understand the fans' frustration, no-one wants to support a team that's got off to a bad start. "What I've learned is that things change so quickly, there's no reason and Peterborough might go and win the next five games." Day underwent his first operation during his time as a player at London Road and is hoping the next will be the last. He concluded: "Last summer the back problems re-occurred so then I needed the second operation, then the third, it's just ongoing problems at the moment and my everyday life is suffering. "Hopefully I can get myself sorted as soon as possible." As one of football's hard luck stories, Day surely deserves a positive final chapter.